Are you looking forward to a new comic book but it’s impossible for you to wait for its release before you know what we thought about it? That’s why there’s DoomRocket’s Advanced Reviews—now we assess books you can’t even buy yet. 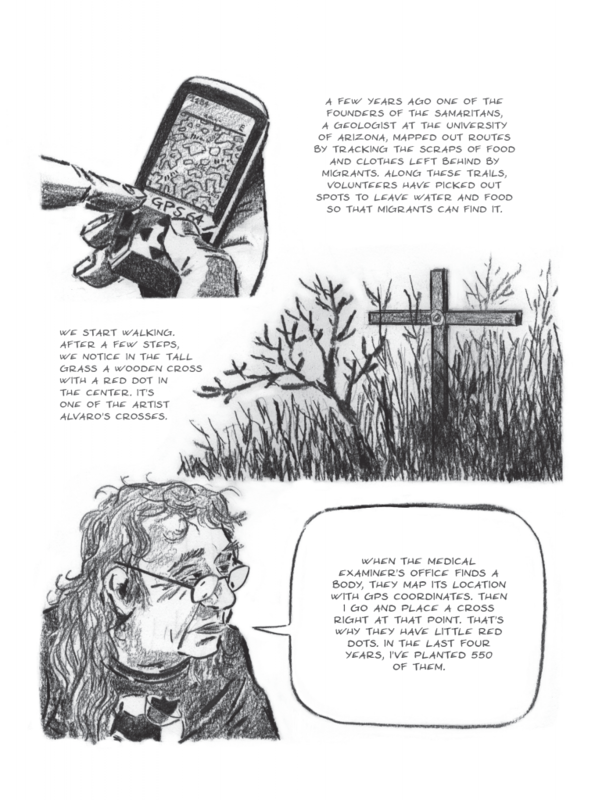 This week: ‘The Scar’, out February 6 from Fantagraphics Press. by Mickey Rivera. On foot, factoring in the need for sleep and maybe some rest stops, it can take up five days to cross the Sonoran desert between the Arizona’s border with Mexico and the nearest large city, Tucson. Between the heat and the wildlife, it’s a walk that can be deadly for those who are ill-prepared or unaware of the dangers. Still, hundreds of migrants attempt the journey every year. 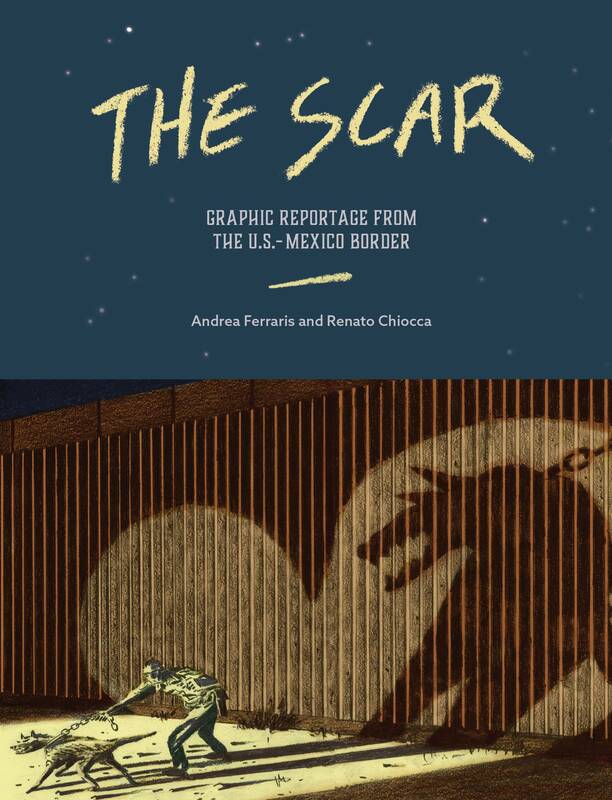 It’s a walk which Italian cartoonist Andrea Ferraris has never had to make, but which he felt drawn to investigate in his new book, The Scar: Graphic Reportage from the U.S.-Mexico Border. 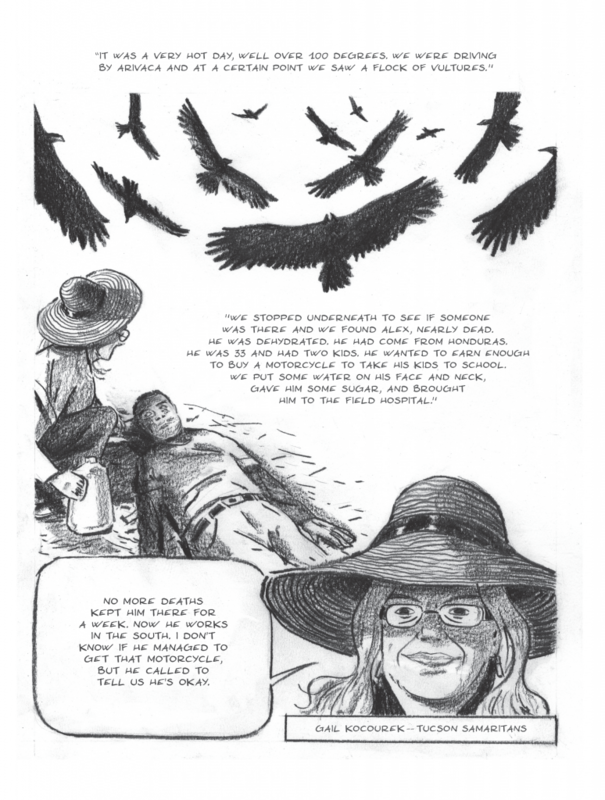 In the vein of comic journalist Joe Sacco, The Scar attempts to shed light on the lives of the humanitarian aid workers and migrants who live and die in the Sonoran Desert year after year. 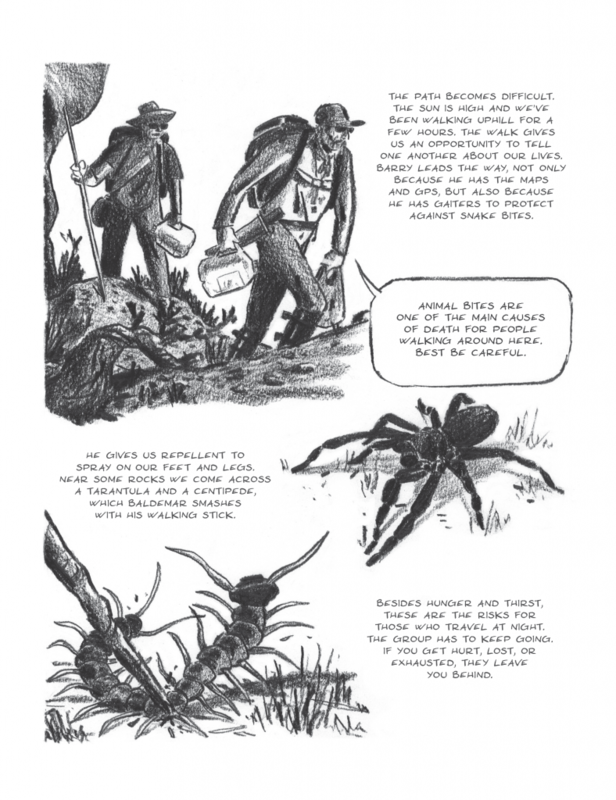 Ferraris has been cartooning since the 1980s, a career that has largely focused on children’s comics. A few years ago he shifted gears, coming out with The Battle of Churubusco (also published by Fantagraphics). Churubusco is a dark and violent book telling the story of doomed U.S. Army deserters during the Mexican-American War making a last stand at the border against U.S. Forces. Praise for it landed him a gig in California showcasing the book’s art, a paid trip to the U.S. that would eventually lead to the personal conversations and events he recounts in The Scar. As a preamble to his trip to America, The Scar begins by describing the night a 16 year-old boy named José Antonio Elena Rodriguez was killed by a U.S. Border Patrol agent. The incident happened in Nogales, a city about 60 miles from Tucson. Nogales is divided between Arizona and Mexico by an 18 to 30 foot wall made of rusty metal tubes capped with steel plates. As Ferraris tells it, José was walking home from playing basketball on the Mexican side of Nogales, close to the wall. Two men with no association to him attempted to scale the wall wearing backpacks, prompting U.S. border patrol agents to show up. When people on the Mexican side began to throw rocks over the wall toward the border patrol, agent Lonnie Swartz opened fire through the metal slats, putting ten bullets into Jose’s back as he walked by. Ferraris then shifts his focus. In the summer of 2017, after his California art show, he and his documentarian friend Renato Chiocca took a trip to Tucson, the intent being to head south to the area between Tucson and Nogales. He wanted to get a present day understanding of the U.S./Mexico border which he had written about, in a historical context, in Churubusco. 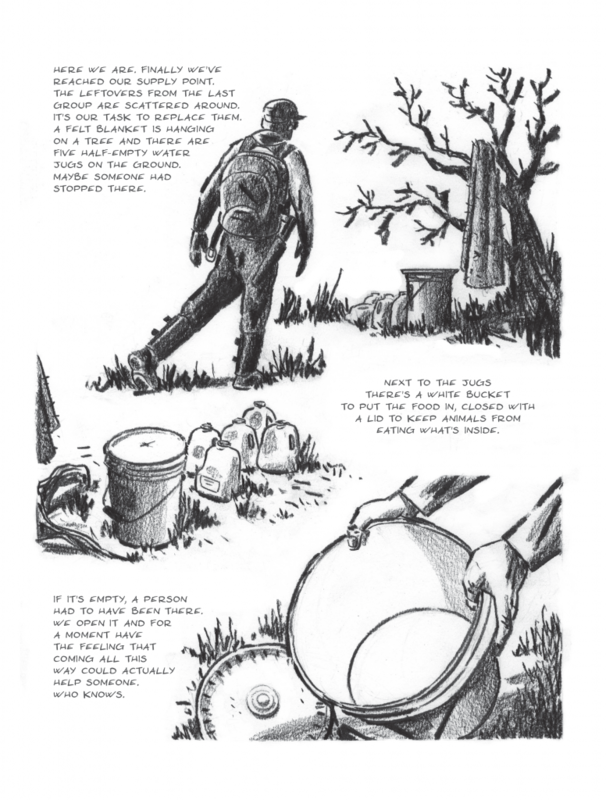 This segment, which forms the bulk of the book, is told with handwritten journalistic prose that floats beside Ferraris’ charcoal illustrations. What Ferraris finds in the desert is a harrowing humanitarian crisis which only rarely enters the incessant mainstream news cycle. It’s not the fantasy crisis President Trump describes, wherein criminals and drugs somehow flow easy and free across the vast border wastes seeking to wreak havoc on an unsuspecting U.S. populace. Rather, The Scar tells a story about migrants so urgently in need of better lives that they’d risk a slow death in the desert heat to pursue it. It tells the story of more than 3,000 bodies discovered in those empty expanses, and of thousands more who have simply disappeared along the way. In a tone that’s both relatable and factual, Ferraris details conversations and journeys with humanitarian organizations who are trying to keep migrants from dying on their dangerous journey, and helping to rescue those who become stranded. He takes a trip with the Tucson Samaritans, a group of volunteers who leave water, blankets, and other supplies out for travelers. He talks with Alvaro Enciso, a Colombian artist who has been crafting wooden crosses and leaving them at the sites where migrants have died. He brings us along on his journey, telling us what he saw and learned. The Scar’s gracefully rough drawings signal spontaneity, and the words that accompany them occasionally slip into sudden impressionistic conclusions that attempt to nail down that feeling of fighting against all odds which both the migrants (and those attempting to help them) live through. Ferraris does a very good job of broadcasting the immediacy of what he’s writing about. It makes for quite a bitter pill. As readers are told that border agents are actively destroying supplies and medical facilities that organizations like Tucson Samaritans and No More Deaths provide, it becomes a matter of self preservation to try and rationalize it away as “things that happened then and aren’t happening anymore”. But Ferraris’ trip happened as recently as 2017—how much could have changed? The immediacy of The Scar becomes readily apparent when you begin to look into the people and events he cites. The case of José Antonio, the boy from the beginning of the book who was gunned down in Nogales by a border patrol agent, is still ongoing. A criminal lawsuit against the agent, Lonnie Swartz, was filed by José’s family, and was still pending at the time Ferraris was writing. In April 2018, a jury found Swartz not guilty of murder, but was hung on two “lesser” charges of manslaughter. Then, astoundingly, the question arose of whether a Mexican citizen on Mexican territory, killed by a border agent who’s on U.S. territory, even had the right to bring charges against their killer in a U.S. court. José’s family has been told by a federal district Judges that they indeed could, but the decision was appealed by Swartz. It’s now possible that José’s case, along with a separate but tragically similar lawsuit, will be taken up by the U.S. Supreme Court. To put it simply: The question of whether or not the family of a Mexican boy killed by U.S. law enforcement can even begin to try to seek a fair trial is currently up for debate. I think this is the kind of real-world absurdity that Ferraris is attempting to capture with The Scar. Hiding behind ideals like lawfulness and order, the U.S. is attempting to enforce the arbitrary boundary between itself and the rest of the planet. The Scar acknowledges how arbitrary it all is, but is much more concerned with telling you about the lives that are being lost in the process. At nearly 40 pages, it is far too short, and its conclusion too abrupt. But what it does with the pages it has is deeply affecting. Created by Andrea Ferraris and Guido Chiocca. ‘The Scar’ hits stores February 6. 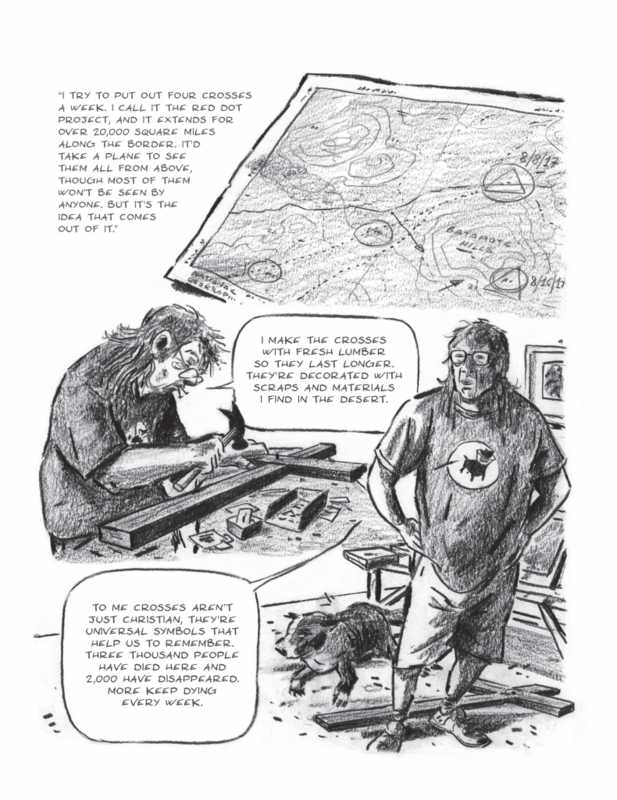 Enjoy this five-page preview of ‘The Scar’, courtesy of Fantagraphics Press!